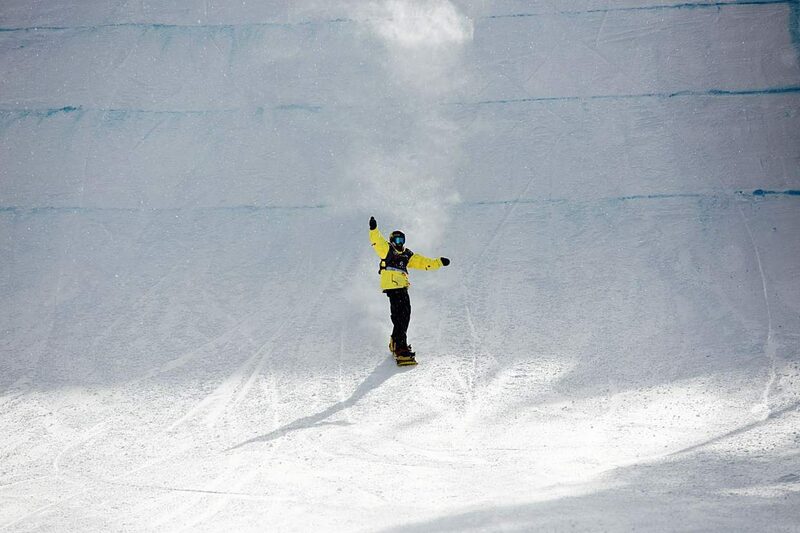 Kyle Mack smiles after his winning run at Saturday's Toyota U.S. Grand Prix at Mammoth Mountain. The performance clinched his spot on the U.S. snowboard slopestyle and big air team for next month's Winter Olympics in Pyeongchang, South Korea. 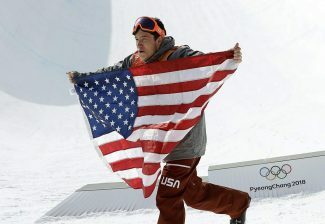 Kyle Mack raises his arm in celebration after landing the final jump on his final run at Saturday's Toyota U.S. Grand Prix at Mammoth Mountain, California. Mack's run was good enough for first place at the final 2018 Olympic qualifying event, effectively clinching his berth on the U.S. snowboard slopestyle and big air team for next month's Pyeongchang Winter Olympics in South Korea. 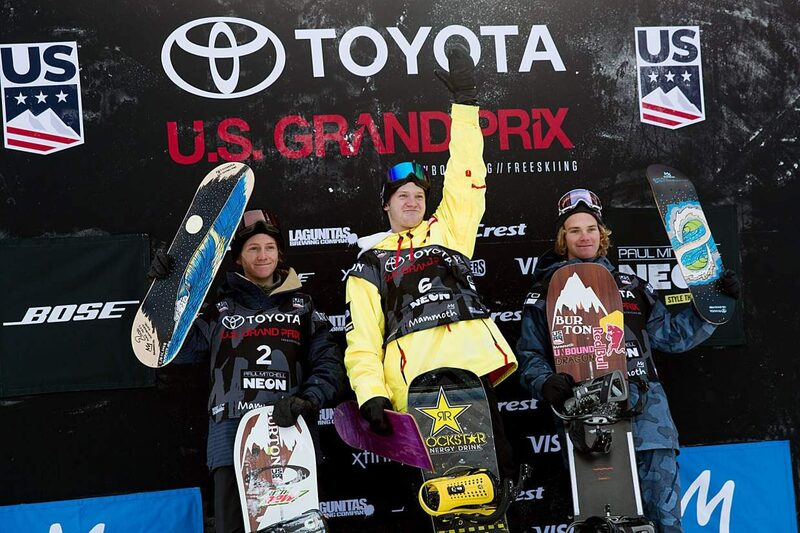 2018 Mammoth Mountain U.S. Grand Prix champion Kyle Mack (center) his fellow Silverthorne snowboarder and second place finisher Red Gerard (left) and third place finisher Brock Crouch of Mammoth Mountain, California are awarded at the podium at at Saturday's Toyota U.S. Grand Prix at Mammoth Mountain. 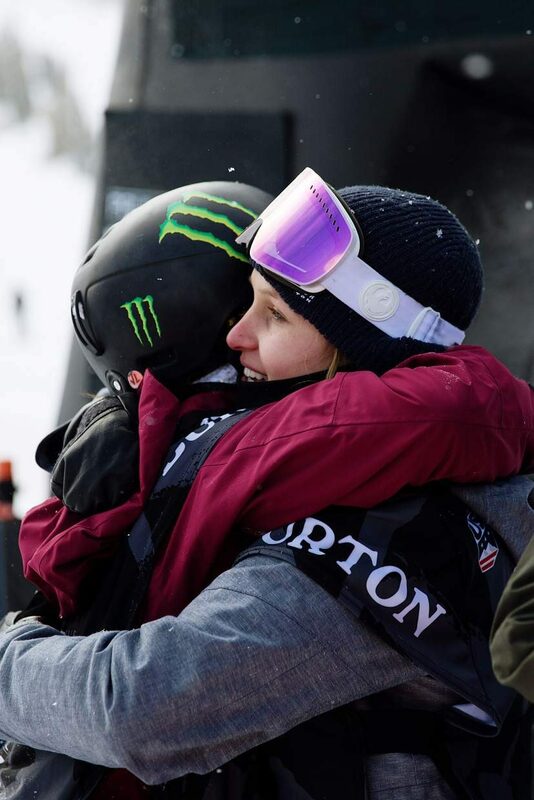 Julia Marino and Jamie Anderson hug after Anderson won Saturday's snowboard slopestyle U.S. Grand Prix event at Mammoth Mountain in California. 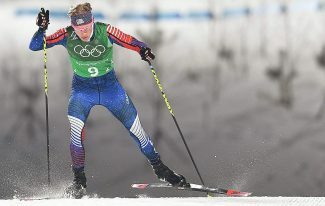 Marino took second, a performance that clinched her first trip to the Olympic games for Team USA next month in Pyeongchang, South Korea. 17-year-old Hailey Langland of San Clemente, California smiles at Saturday's U.S. Grand Prix snowboard slopestyle final at Mammoth Mountain, California where Langland's third-place finish clinched her spot at next month's Pyeongchang Winter Olympic Games in South Korea. 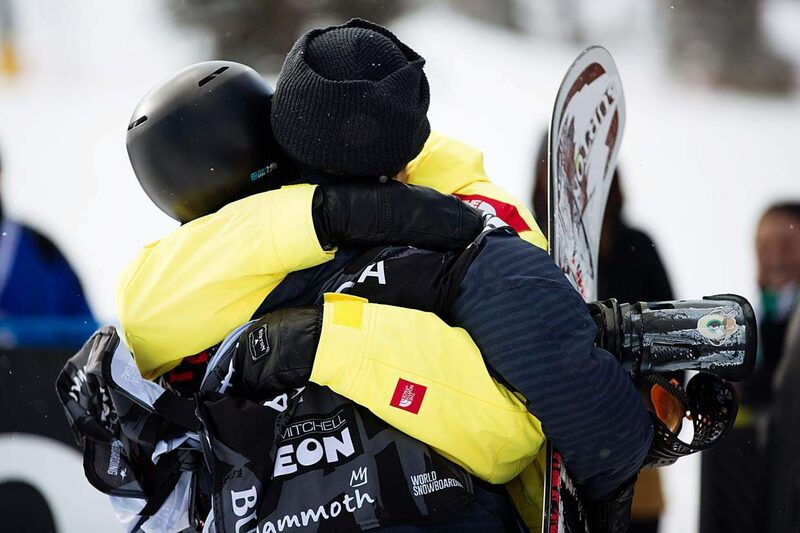 Kyle Mack and Red Gerard hug after the Silverthorne snowboarding duo took first and second at Saturday's Toyota U.S. Grand Prix at Mammoth Mountain. 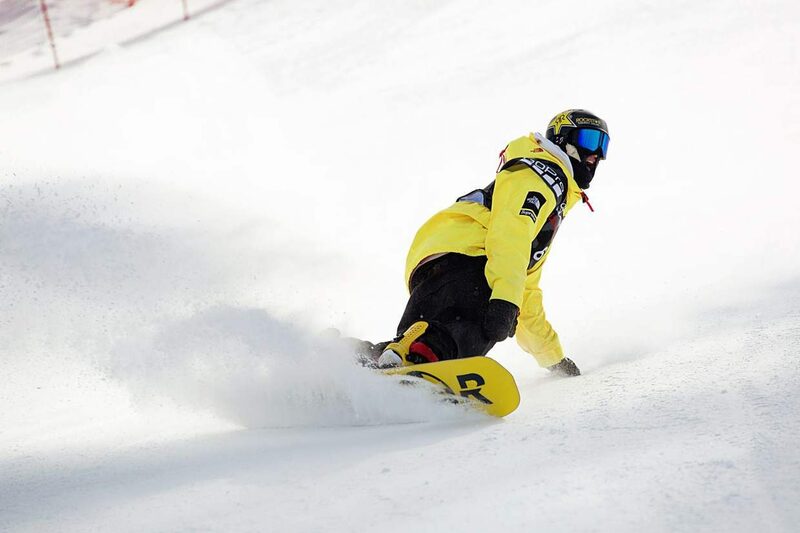 Mack clinched his spot on the U.S. snowboard slopestyle and big air team for next month's Winter Olympics in Pyeongchang, South Korea at the event while Gerard and a third Silverthorne snowboarder, Chris Corning, will join him as the country's top two qualifiers. Kyle Mack excitedly carves a turn in fresh snow after landing his Toyota U.S. Grand Prix winning run at Mammoth Mountain in California on Saturday. 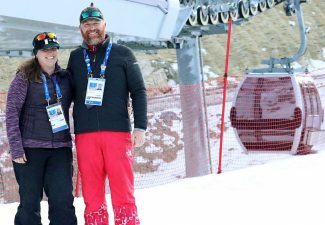 The victory was enough to earn Mack a spot on the U.S. snowboard slopestyle and big air team at next month's Winter Olympics in Pyeongchang, South Korea. 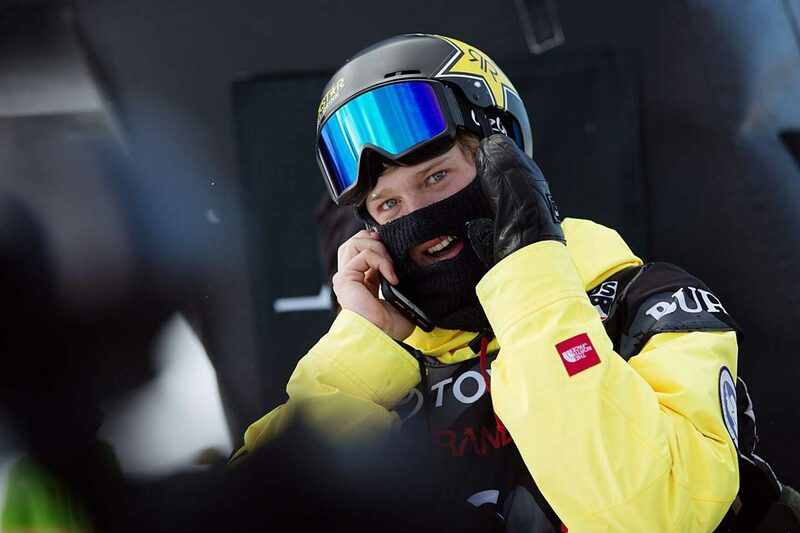 Kyle Mack smiles while speaking to his father on the other end of the phone after Mack won the Toyota U.S. Grand Prix at Mammoth Mountain and clinched a spot on the U.S. snowboard slopestyle and big air team for next month's Winter Olympics in Pyeongchang, South Korea. Come 6 p.m. on Friday, Feb. 9, bar room televisions and living room livestreams alike across Summit County will be keeping a close eye on the action half a world away when three young men who’ve called Silverthorne home compete as the top three American slopestyle snowboarders at the Pyeongchang Winter Olympics. 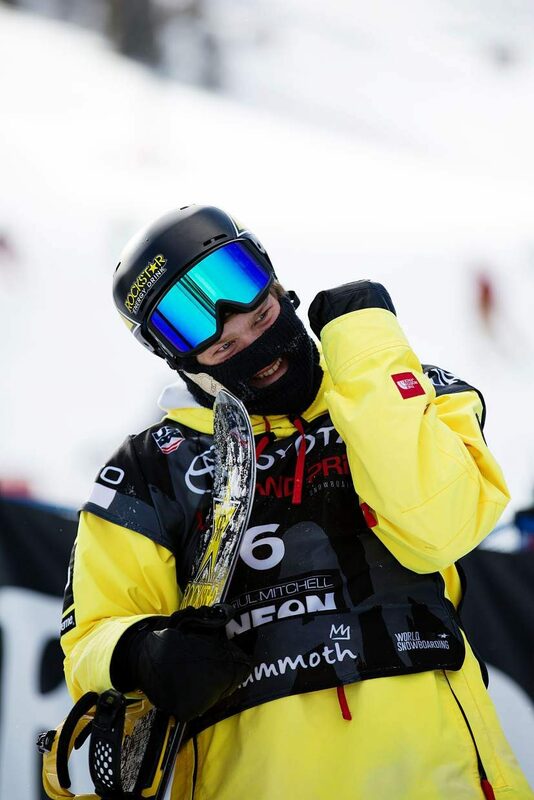 It wasn’t until his final run at the final U.S. Olympic qualifying event of the 2018 cycle, but — with his score of 87.55 to secure an enthralling victory at Saturday’s U.S. Grand Prix at Mammoth Mountain, California — West Bloomfield, Michigan, native and Silverthorne resident Kyle Mack officially clinched a spot at next month’s South Korean games. Mack is the third American snowboarder to secure placement on the three-to-four-man team, following fellow Silverthorne residents Chris Corning and Red Gerard, who each respectively earned their trips to Pyeongchang at the two previous Olympic qualifiers at Dew Tour in Breckenridge last month and at the U.S. Grand Prix at Aspen Snowmass last weekend. The 20-year-old Mack’s victory on Saturday was punctuated by a hug with Gerard, who threw down a run of 79.68 on the final run of the competition to take second place and join Mack and third-place finisher Brock Crouch (79.30) of Mammoth Mountain on the podium. Corning did not compete in this week’s Mammoth Mountain slopestyle event in the wake of a lingering lower back and hip injury suffered at a previous Olympic qualifer last month at Copper Mountain Resort. This same Summit County trio did, however, sweep the podium two months ago at a World Cup event in Milan, Italy. Mack, who is the first snowboarder to land a triple cork Japan in competition, bounced back from a poor performance and score of 22.13 on his first run to earn an 80.63 on his second run and ease the pressure heading into his final run. On that final trip down the course, Mack landed a triple cork 1440 to bump up his best score to 87.55 and put the exclamation point on the Olympic qualification. 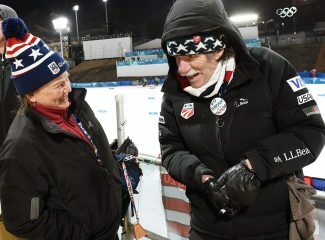 Afterward, Mack sported a yellow North Face jacket with an American flag across the back while hugging Gerard, his mother and calling his father via cellphone before saluting the crowd at the top of the podium. The 2018 Pyeongchang Winter Olympics snowboard slopestyle finals will take place live at Phoenix Snow Park at 6 p.m. mountain time on Feb. 10. The women’s slopestyle finals take place at the same time and location the following day. Men’s slopestyle and big air snowboarders will get a 10-day break before the inaugural Olympic big air qualifications take place at Alpensia Ski Jumping Centre live on Tuesday, Feb. 20, at 5:30 p.m. mountain time. The men’s big air finals are scheduled to take place live at the same location at 6 p.m. mountain time on Friday, Feb. 23. 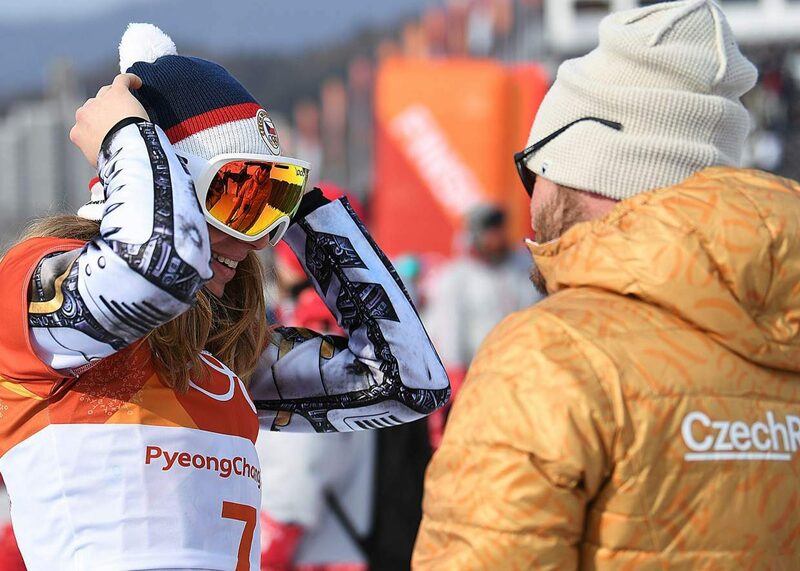 With their second- and third-place finishes respectively at Saturday’s Mammoth Grand Prix, Julia Marino and Hailey Langland officially booked their Olympic trips to head to South Korea with the woman who was at the top of the slopestyle podium Saturday. Jamie Anderson put a stamp on her Olympic qualification by winning Saturday’s slopestyle event with a score of 84.10 on her first run. That mark was more than nine points better than Marino’s second-place score of 74.86. Langland’s first run score of 61.36 was good enough to get her on the podium and officially clinch her spot to South Korea.